It sounds like forward Jordan Greenway will start the season where he finished the previous one. Greenway has appeared in only 11 NHL games, five of which came in the playoffs, after turning pro earlier this year following his junior season at Boston University. 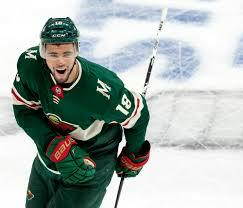 And although his face time with the Wild was limited, the 21-year-old made quite the impression. He scored only once and helped set up another goal, but he seemed to get better in time. The rookie was one of the team’s more impactful players in that first-round loss to the Jets, using his 6-foot-6, 226-pound frame along the boards and in front of the net. Before suiting up for training camp, Greenway will participate in the 2018 NHL Prospect Tournament in Traverse City, Mich. The tournament starts next Friday and runs until Sept. 11. Winger Dmitry Sokolov, defenseman Louie Belpedio and goalie Kaapo Kahkonen are also among the Wild draft picks on the team’s roster, which will be led by Iowa Wild coach Tim Army and his staff. Two days after the tournament concludes, the Wild will open training camp in St. Paul. Boudreau hopes defenseman Ryan Suter, who’s recovering from a severe ankle injury suffered late last season, is a full participant – although Boudreau said Suter may not take contact in practice at the outset as a precaution. Winger Zach Parise, who finished last season with a fractured sternum, is good to go, Boudreau said, while forward Luke Kunin will likely be eased into camp after he tore his ACL earlier this year. “There’s no real rush for him,” Boudreau said.